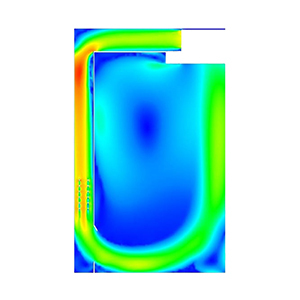 FEA-Solutions (UK) Ltd - Finite Element Analysis For Your Product Design | 064: Process Oven 2D fluid flow and heat transfer analysis of rectangular oven used for manufacturing processes. The CFD results confirmed the non-uniform temperature distribution. Recommendations were made to improve flow and hence temperature uniformity.